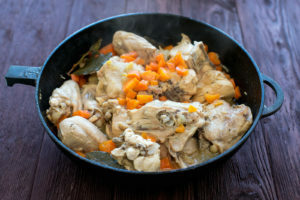 One of the best ways to cook yourself thin is to take a normal recipe and look for ways to make it healthier for you. I love shrimp scampi and don’t often make it even though shrimp is quite low in calories. Ina Garden’s recipe calls for a lot of butter. I would halve the butter as you don’t need that much for good flavor. The olive oil is healthy, so I’d leave that alone. Plus, we need to not be afraid of fat. It helps us feel fuller for longer. I’d also save some time and buy pre-cleaned shrimp so you don’t have to spend the time de-veining which can get pretty gross. Shrimp is a fairly rich tasting protein as well. 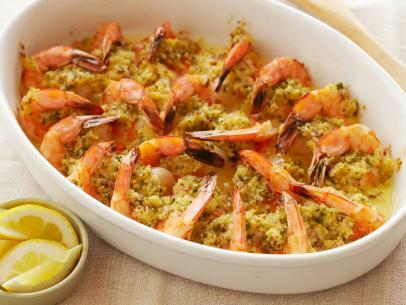 Most people don’t need a lot of shrimp to feel full. In this video, you’ll see the steps laid out. You’ll need to go to Food Network to get the recipe. The panko will add a nice crunch so you won’t miss having bread. I would also consider using 8 Tbs (1 stick) of butter and adding in some spiralized squash on the bottom so it would seem like scampi pasta. It would all bake at the same time. With my taste preferences, I’d leave out the red pepper flakes, and I’d increase the garlic. I love garlic. Finally, I’d use unsalted butter and then season to taste with some good kosher salt. Too much salt makes me retain water. And since I’ve been cooking more for myself, I find that I’m more sensitive to salt. I cook with a little salt to build up flavor. So for this recipe, I’d salt it as you go along. You’ll have more control with unsalted butter. Plus, if you have some really large flake salt, you can finish the dish with it and make it look really pretty.